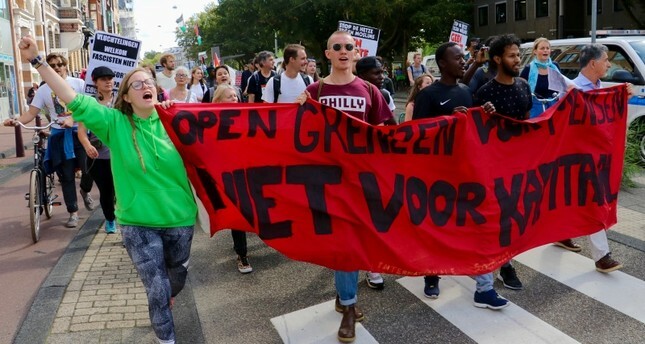 A large protest took place Saturday in the Netherland's capital Amsterdam to fight against the European Union's immigration and refugee policies. Organized by various institutions, most of the participants were Turks, migrants from the Denk Party and were from some civil societies. Protesters flooded Dam's Square in Amsterdam and marched down Museumplein Square with chants and slogans reading, "human migrant politics," "open the door do people, not funds," "limitless solidarity," "first human rights," "our door is open to everyone," "open the borders," "no room for racism," and many more. Ewout van den Berg, president of the International Socialist Foundation, said that the aim of the protest was to highlight the issue of sending the refugees back to their war-torn countries after attempting to find refuge elsewhere. He stated that the issue of thousands of refugees dying while crossing the treacherous seas of the Mediterranean is embarrassing and that the Netherlands should "provide them with the opportunity to come" instead of closing the border. Van den Berg stated that he would like the government to allow refugees to enter the country with their children instead of turning them away. In July, thousands of people also marched through German cities to protest EU policy on refugees and support NGOs helping rescue migrants in the Mediterranean. Around 12,000 people attended a rally in Berlin, local radio reported, while Munich and Leipzig also saw protests called for by charity organizations including German-based Lifeline, whose rescue boats were recently prevented from entering Italian waters. More than 1,400 people have drowned attempting to cross the Mediterranean so far this year according to the International Organization for Migration, the U.N.'s migration agency. The risk of dying in the central Mediterranean Sea has jumped to one in 18 for migrants this year as non-governmental rescue ships are facing difficulties on this key route to Europe, the U.N. Refugee Agency (UNHCR) has said. Last year, one in 42 migrants died or went missing while trying to sail to Italy on the central Mediterranean between January and July.